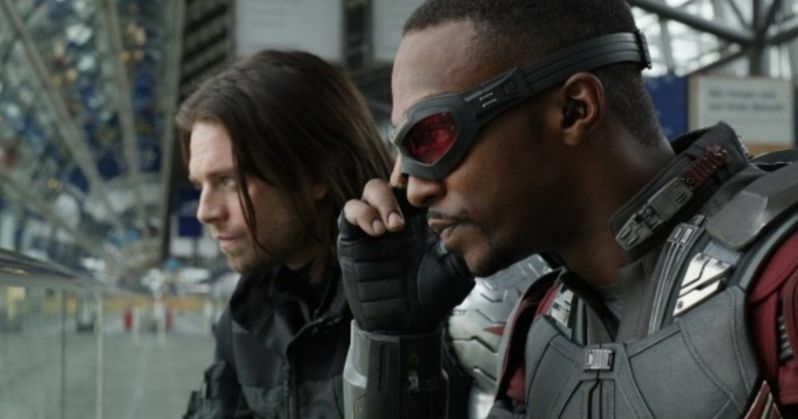 In two separate interviews, Captain America stars Anthony Mackie and Sebastian Stan said they'd love to make a Winter Soldier and Falcon spin-off movie in the style of 48 Hours. The two actors are close behind-the-scenes, and the idea of that style of movie being made in the Marvel Cinematic Universe would be pretty awesome. However, there's no telling what the MCU is going to look like after the events of Infinity War and the still untitled Avengers 4, after Thanos gets finished. Sebastian Stan was interviewed on the set of Infinity War over the summer where he was asked about the possibility of a Falcon and Winter Soldier spin-off movie. He instantly said yes, and then mentioned that the people around the set are the ones who can make it happen. He explains. "We absolutely can. Absolutely. I mean, the right people to make that happen are certainly within feet from us right now." Before being asked about the possibility of the spin-off, Stan talked about the on-screen relationship between Bucky and Sam. He went on to compare the relationship to Midnight Run and iconic buddy comedy 48 Hours. He had this to say. "To me, it's like Martin Brest film classic, Midnight Run, you know. It's really just sort of in my head, like, 48 Hours or a buddy comedy from the '80s or the '90s. That's how I see it." In a completely separate interview, Anthony Mackie expressed his interest in the Winter Soldier and Falcon Marvel spin-off movie. He too, mentioned the friendship between the two actors and mentioned that they have a "mutual respect" for each other. Mackie also added that they might have to get physical a few times during the course of the movie, if it ends up becoming a reality. "Sebastian is a damn good actor and he's a damn good friend, so I think our relationship - really, it's the three of us, he, (Captain America actor) Chris Evans and I - our relationship kind of works really well because there's a mutual respect. So a spinoff would be great, but it would be like Nick Nolte and Eddie Murphy in 48 Hours, that would be our spin-off. It would end up with us beating the crap out of each other three or four times, I know it." The reality of this spin-off movie with Winter Soldier and Falcon is a long shot, but stranger things have happened. Taika Waititi would probably be the best director for the job and it could end up as something unique and funny. We'll have to wait and see what happens after the dust settles in Infinity War and Avengers 4, since Bucky isn't even Winter Soldier anymore. The next phase is going to show some pretty drastic changes in the MCU, so maybe there's room for a buddy comedy. For now, we have Infinity War to look forward to, which is only a few weeks away now that Marvel Studios pushed the release date up one whole week. We're more than likely going to get a little tease of that buddy comedy while Bucky and Sam are on Wakanda, if there's enough time. You can check out both interviews with Anthony Mackie and Sebastian Stan below, from the Entertainment Tonight YouTube channel. Related: New Research Ends Marvel Vs. DC Movie Debate, But Is It a Fair Fight? The 2 MCU Movies You Must Watch Before Endgame According to the Russo Bros. Does the Avengers: Endgame Trailer Tease Captain America's Death?